All Products > "58452 Tamiya 1/10 Sand Scorcher SRB Kit"
Tamiya is celebrating the 30th anniversary of the Sand Scorcher with an improved re-release of the model. The new improvements include more fine tuned parts. Just as the original, the updated Sand Scorcher features ribbed front tires and paddle rear tires. Since the Sand Scorcher and the Buggy Champ use the same chassis, the spare parts are interchangeable. 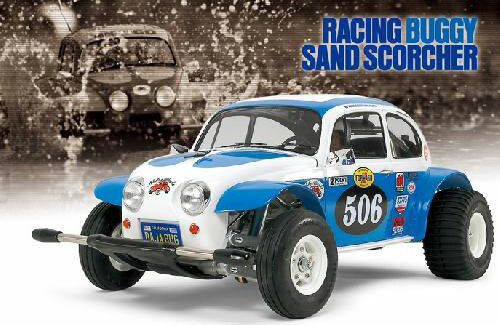 • This is an Officially Licensed 1/10 scale R/C assembly kit of the Sand Scorcher. • Comes equipped with full ball bearings to reduce friction loss. • Type 540 motor included. • A duraluminum plate reinforced 2mm thick FRP main frame for added strength and flexibility to ensure stability. • Newly designed die-cast front and rear suspension arms, front axle, and wheel hubs. • Transparent case protects the R/C mechanisms. The lid can be easily detached by cam locks. • Original blister pack style packaging. • Detailed hard plastic body included. • 2-channel R/C system and battery pack separately available.